Just about every person we spoke to over the last year was busy, and in 2018 that was certainly true for Valley Homes too. 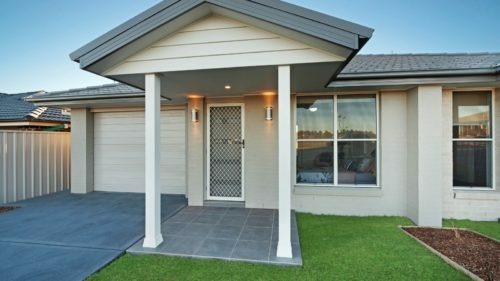 We built a house a week as part of a unique defence housing project, Wirraway Estate, and after a lot of hard work and clever systems design we won an award for our WHS Management System. Plus we consistently provided local families and astute investors budget advice, all while delivering quality builds on a range of different building options. This included acreages perfect for modern families and duplexes and dual occupancies to suit the unique needs of retirees. Taubmans Colour Inspirations showcase a range of looks from coastal to industrial and more traditional palettes with bold and spirited colours for the home that reflect harmony and nature. Colour giant Pantone has also released their must-have colours and Living Coral is Pantone’s pick for 2019. So while millennial pink may be out of favour, vibrant corals are set to be adding pops of colour in on-trend décors. In 2019 recycled, sustainable, textural, and natural designer pieces will continue to grow in popularity. Texture is a big one as it is both a visual and sensory experience, and some of the best interior designers will be carefully layering large pieces of marble or stone with soft timber tones. Natural wool and cotton rugs, velvety and soft cushions, and flowing window dressings are set to be partnered with warm metallic materials and clean, sleek lines. Gold is the metallic colour of choice for 2019, particularly popular with the modern art-deco movement, brought to life as bar carts, striking mirrors, and bathroom and kitchen fittings. The kitchen continues to be the centrepiece of home life and the best house plans are reflecting this. Open plan living is still in high-demand, but the 2019 version includes greater focus on fostering conversations and creating design flow for keep families connected to each other, as well as connecting them to the world in which they live. The internet of things will really come into play with smart fridges being one of the most sought-after appliances in modern kitchen designs. Landscaping is no longer a solely outdoor undertaking. In 2019 we will see more indoor living spaces featuring green walls and even micro urban farming units transforming homes and living spaces in meaningful and nourishing ways. Outdoor rooms are predicted to increase in popularity and one of the most fun outdoor predictions is the emergence of adult-treehouses. Another favourite here at Valley Homes is the movement towards private oases cleverly tucked away in your very own garden. They’re perfect for day-to-day luxury resort-style living, while also offering unique entertaining opportunities for guests. Property market investment trends are probably the most important to pay attention to for developers looking for their next investment project, and also for our local families, couples and retirees wanting to either get into the property market, upsize or downsize in 2019. The good news is while some markets are on the decline regional Australia is tipped to be where Australia’s property market stays strong in 2019. So it seems Newcastle, Hunter Valley, Lake Macquarie and Port Stephens residents are predicted to benefit from a healthy property market in 2019. Whether your New Year’s resolutions or 2019 goals are looking towards a refurbishment, renovation or a completely new construction, hopefully now you are armed with all the design inspirations and trends to get your started for what will no doubt be a busy 2019 – and if it is quality construction and building, and architectural house plans you want in your year ahead, talk to our team. VALLEY HOMES’ WHS MANAGEMENT SYSTEM IS A WINNER!